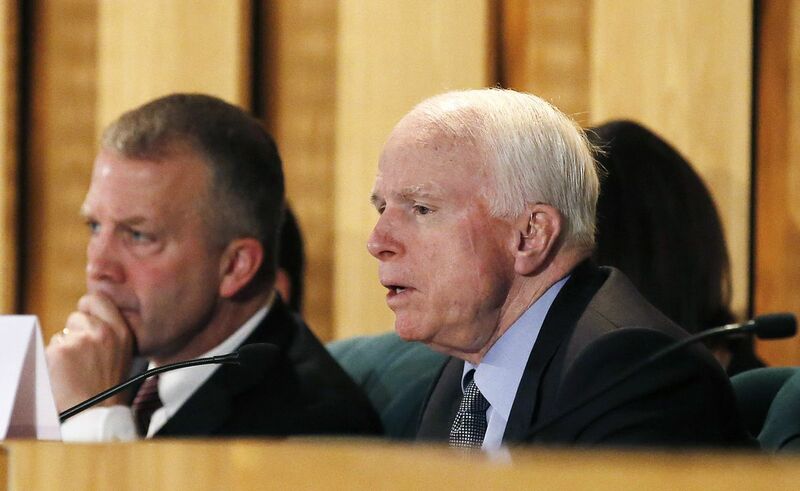 WASHINGTON — Alaska Sen. Dan Sullivan has picked up two new positions after Sen. John McCain's death. Sullivan will now chair the "readiness" subcommittee on the Armed Services Committee. McCain chaired the full committee, and positions were shuffled after his death in August. Sullivan's new subcommittee covers "readiness and management support," meaning military readiness and training, military construction and contracting, and procurement of defense technologies and ammunition. The committee oversees operation and maintenance of budget accounts, and logistics and auditing agencies at the Defense Department. Sullivan said he plans to hold a hearing on Arctic readiness as soon as possible. Sullivan will also become the full chair of the International Republican Institute, a position McCain held for 25 years and which he asked the Alaska senator to take over. McCain made the request to Sullivan during a visit in Arizona this summer, Sullivan said in an interview this week. "I was very close with Senator McCain," Sullivan said. McCain helped Sullivan carve out expertise and areas of responsibility soon after Sullivan joined the Senate, he said. "Nobody did that as much and as energetically as he did," Sullivan said. Sullivan visited McCain, then under treatment for brain cancer, at his ranch about two months ago, Sullivan said. "At the end of that meeting, he and his wife asked me to take over the chairmanship for the (International Republican Institute)," he said. "I was kind of surprised by that, but as you can imagine, I wasn't going to say no to that." The International Republican Institute and its sister organization, the National Democratic Institute, were created in 1983 under then-President Ronald Reagan with the objective of helping other nations foster democracy with responsive political parties and broad inclusion of women and young people in the political process. "Serving as chairman has been one of the most satisfying experiences of my life," McCain wrote in a letter to the board upon his resignation, according to the Washington Post.